The matamata appears occasionally in the pet trade. 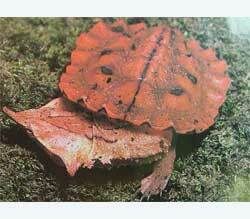 The matamata is a sedentary, aquatic species that has a remarkable appearance. Matamatas prefer shallow waters where they can breathe by extending their long necks and tubed noses to the surface. Adequate space is important. One or two small, matamata turtles could properly live in at least a 55 gallon breeder size tank, but more space is always preferable. Cleanliness is essential for the health of the turtles. Enclosures should be cleaned frequently. Water temperatures between 75 and 80 degrees Fahrenheit are fine. Vitamin D and calcium supplements, used in conjunction with full-spectrum lighting, will give matamatas a better chance at good health.